A futuristic new concept car has been revealed by DS, showcasing the French marque’s vision for 2035 in the form of an all-electric coupe. It’s called the DS X E-Tense, and one of the first things you’ll notice is the asymmetrical design. Viewed from above the car is parallelogram shaped, with the driver sat further forward than the passenger in a separate cocoon. Both cockpit and cocoon areas are accessed by gullwing-style doors, operated by handles that sit flush with the car’s creased bodywork. Looking at the car’s face, it’s possible to pick out influences from 2016’s more conventional E-Tense concept, with the shape of the grille and front air intakes clearly spun off from that car. Of course, the grille sits to the driver’s side of the vehicle and is flanked by LED lights woven into the brand’s distinctive diamond motif. Explaining the process that led to this latest concept, Eric Apode, DS’s Vice president of products, said the brand “wanted the opportunity to dream about 2035”, the year it will mark the 80th anniversary of the classic DS. “It’s a manifesto to show what we want to do as a brand,” he continued. “The concept still has a steering wheel and pedals. Probably in 2035, many things will have changed and there will be a lot of room for mobile devices but we [DS] do not want to address this. 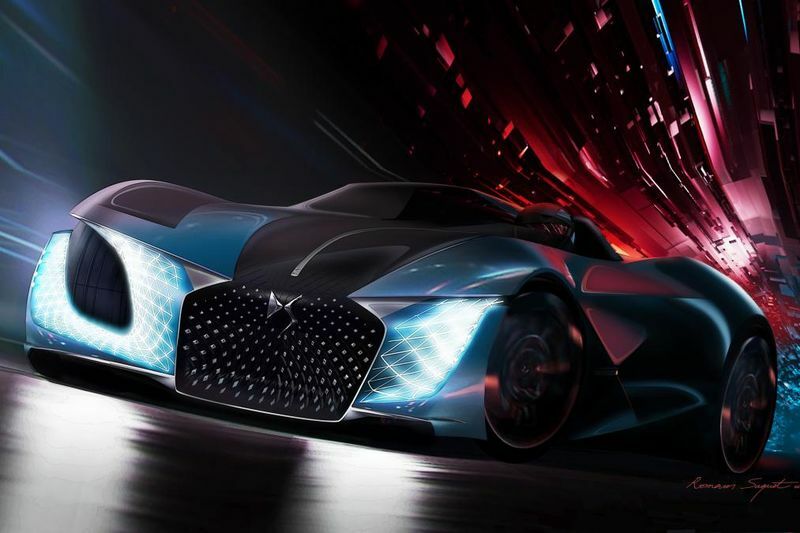 DS predicts that future lighting technology means that conventional headlights will be on their way out by 2035, with the intricate LED structure placed directly into the bodywork of the X E-Tense representing what it thinks could be a possibility. The taillights use the same system, with the DS badge and the focal point of the car’s rear flowing down from the passenger pod. Inside, the driver’s pod is trimmed with a two-tone blue leather upholstery with pearl stitching, while the steering wheel combines leather, wood and metal. The wheel is equipped with driver monitoring sensors too. Things are slightly different on the passenger side of the vehicle, with the navy blue leather contrasting with red hues. The passenger gets filtered, scented air, while a glass floor opens up views of the road below. DS envisions the X E-Tense with fully autonomous driving capability, while many of the car’s functions are controlled through an AI personal assistant called IRIS, which takes the form of a hologram in the cabin. Powertrain specifications have been outlined too. The X E-Tense uses two inboard-of-wheel motors – one mounted on each front wheel. When in its most docile ‘road’ setting, the motors deliver a maximum power of 533bhp. Flicked into ‘circuit’ mode, power ramps up to 1,341bhp. Electric Is The Future, But Petrol Still Turns Us On! Video: Check Out This Insane Bmw I5 Concept Car! Video: Aleksandra Gaca Designs Renault's Concept Car Will Go Well With Your Home!